As is the case with the majority of crossover models, the XV Crosstrek achieves fuel economy ratings that SUVs simply can’t touch. Likewise its fuel economy performance holds up well against other vehicles found in the crossover class of cars. The premium manual version of the XV Crosstrek gets 25 mpg city and 30 mpg highway; the automatic edition scores 25 mpg city and 33 mpg highway. These results hold up well against similar vehicles in the crossover class. The XV Crosstrek is after all a Subaru, and the company has long been known for putting some of the best all-wheel drive systems on the road. The XV Crosstrek is no different, handling well in a wide range of challenging conditions. While it’s hardly an off-road champion, at the end of the day Subaru sells plenty of cars to families that are looking to purchase vehicles with good fuel economy that can stand up to a sudden one-foot burst of snow in the winter. Subaru vehicles are popular with drivers who have long commutes in northern areas or live in areas that receive less than adequate attention from highway maintenance crews. The XV Crosstrek does a fine job of sustaining this tradition for Subaru. 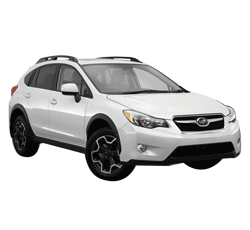 As we mentioned, the XV Crosstrek is an all-wheel drive vehicle with a smaller 4-cylinder engine. There’s no getting around the fact that the XV Crosstrek simply does not deliver acceleration or power. It’s a good vehicle for bad conditions, but it’s not a substitute for an aggressive 4-wheel drive by any standard. Even taken in comparison to similar rides in the crossover segment, such as the Mazda CX-5, the XV Crosstrek comes away looking a bit wimpy. Subaru diehards won’t be fazed much by the performance issues, but folks looking for a more exciting car may wish to look at other options before settling on the XV Crosstrek. The XV Crosstrek is largely a family or commuter vehicle, and that means that the available entertainment options matter. The six-speaker audio system is excellent by the standards of factory-installed sound systems, plus it offers expected items such as a USB port, Bluetooth accessibility, and touchscreen and voice activation capabilities. The media options rise to the level drivers want in modern vehicles, and the audio quality itself exceeds expectations. Some complaints have been heard about the on-board navigation system, but on balance it’s not considered unusable. The climate controls in the XV Crosstrek are generally considered simple to use. Most of the internal systems in the XV Crosstrek are designed to be easy to understand and straightforward to use. Being a compromise design between a hatchback and an SUV, the XV Crosstrek would seem like a solid choice for cargo capacity. Unfortunately it falls short in this department, especially if drivers choose to compare it to similar vehicles in the crossover segment of the automobile market today. Being based on the Impreza body, the XV Crosstrek has a very accommodating cabin area. It’s able to seat five passengers comfortably, so there’s little doubt that it can handle most family needs. The XV Crosstrek compares very favorably on cabin room, but drivers seeking extra leg space may also want to take a look at the Subaru Forester. Simply put, the XV Crosstrek is a largely unsexy ride. It doesn’t have the more aggressive handling characteristics that are seen in better models in the crossover class, especially those available from the folks at Mazda. Further on the downside, some reviewers rate the XV Crosstrek’s handling to actually be worse than many SUVs, vehicles that are notoriously poor performers. However it’s worth nothing that this Subaru model isn’t intended to compete on handling, and it most cases simply doesn’t bother to even try. The XV Crosstrek comes with a price of $22,790 for a base model. Already designed to appeal to the family set, the XV Crosstrek does a very good job of leaving some meat on the bone for the budget conscious consumer. Coupled with good fuel economy, the XV Crosstrek is an option that should be on the minds of any household worried about a bank account balance. The XV Crosstrek is designed to be an all-wheel, all-the-time ride, and Subaru favored higher ground clearance in order to help the vehicle cope better with treacherous conditions. It’s a good ride for handling deep snow, and like all Subaru cars it comports itself well in a variety of conditions. Reviewers have noted that the XV Crosstrek is far from a quiet road going down the road. The cabin is not well-designed to keep noise out, especially at highway speed. Unsurprisingly a noted all-wheel drive performer also outperforms in overall safety. However it’s worth considering that the crossover class as a group does well in most safety tests. The XV Crosstrek, while underpowered, is an overall good performer. It gets good fuel economy and holds up well to Subaru’s long tradition of building safe all-wheel drive vehicles. Drivers looking for sexier options should look elsewhere, but most will want to give the XV Crosstrek a test drive.